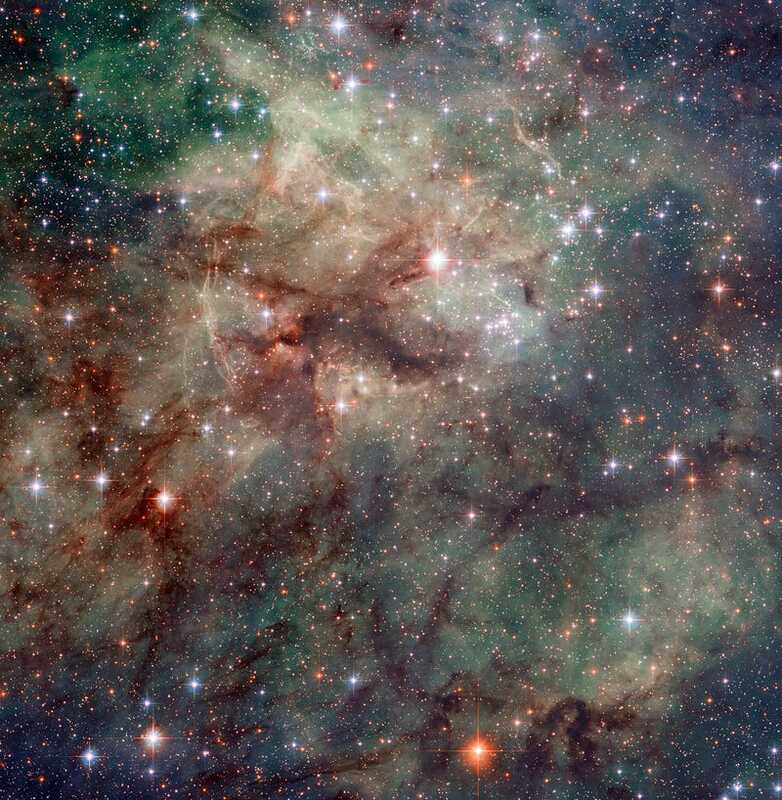 Hubble telescope has captured this incredible, highly-detailed shot of the Tarantula Nebula, which is an enormous, many-legged cloud of dust created by multiple supernovae - one of which was visible from Earth back in the 17th century. Many new, hot stars burn in the heart of the nebula, ionizing its gas and giving it that lurid red glow. The nebula is so bright that it's visible with the naked eye on clear nights here on Earth, 170,000 light years away. Click here to see the embiggened image! The part of the nebula visible in this image from Hubble's Advanced Camera for Surveys is criss-crossed with tendrils of dust and gas churned up by recent supernovae. These supernova remnants include NGC 2060, visible above and to the left of the centre of this image, which contains the brightest known pulsar . . . Near the edge of the nebula, outside the frame, below and to the right, lie the remains of supernova SN 1987a, the closest supernova to Earth to be observed since the invention of telescopes in the 17th century. Hubble and other telescopes have been returning to spy on this stellar explosion regularly since it blew up in 1987, and each subsequent visit shows an expanding shockwave lighting up the gas around the star, creating a pearl necklace of glowing pockets of gas around the remains of the star.